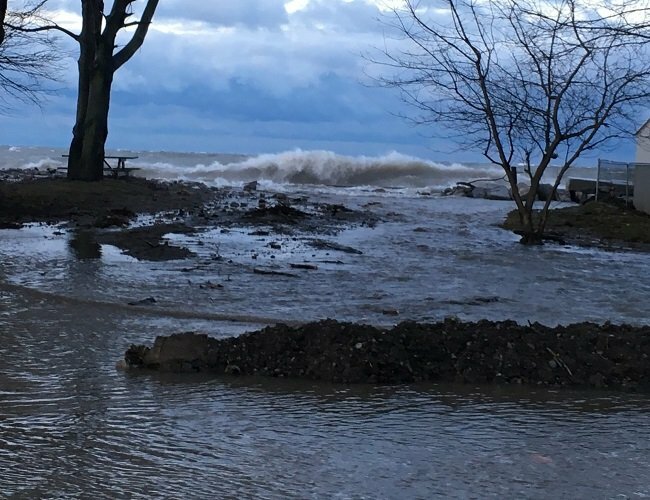 Watershed Conditions – Safety Bulletin – Lake Erie Shoreline – February 7, 2019 – 7:30 p.m.
• A Special Weather Statement and a Gale Warning have been issued due to high winds this evening and overnight. • Sustained winds over 45 km expected until tomorrow evening. • Peak winds may reach 60 km/hr with gust up 90 km/hr. • Risk of shoreline damage and flooding to areas where they are exposed to the open lake. A Special Weather Statement and a Gale Warning for western Lake Erie have been issued by Environment Canada due to strong southerly winds expected this evening and overnight. Strong sustained winds from the south to southwest are expected this evening changing over to more westerly during the overnight period. Wind speeds over 45 km/hr are expected from now until tomorrow evening. Peak wind speeds this evening and early overnight could potentially reach 60 km/hr with gusts up to 90 km/hr. Where the shoreline is open, strong winds will be driving waves onto our Lake Erie shoreline in Chatham-Kent and Elgin County. It is not clear whether any ice protecting the shoreline would be able to withstand these conditions. There is a risk that wave action could damage shoreline protection works and cause shoreline erosion in other areas. In flood prone areas such as Erie Shore Drive in Chatham-Kent, flooding caused by waves crashing against the shoreline protection works and spraying water up onto the land may occur. In addition, temperatures are expected to drop below freezing during the overnight period and stay there throughout the weekend. Residents along the Lake Erie shoreline should pay attention to local conditions and prepare accordingly. Contact: LTVCA Administration Office (519-354-7310) regarding this message. After hours number 519-351-2240.